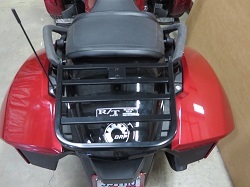 New design allows the Luggage Rack to be compatible with the BRP Passenger Backrest. Gives you extra space to strap down luggage or mount a trunk or saddle bag. Installs on the outside of the hand rails using longer bolts mounted through the holes of the hand rails. Just installed the F3 luggage rack on my Spyder, my wife calls it my GoBot, great install, looks like it came from the factory with it. Heavily made looks like it will be around as long as I have the Spyder. Purchased this and it's a really great addition. I've had it for more that a year and it has worked fantastic. Did a 2 week trip and had all my goods on my F3 and really appreciated the extra area to put my stuff.